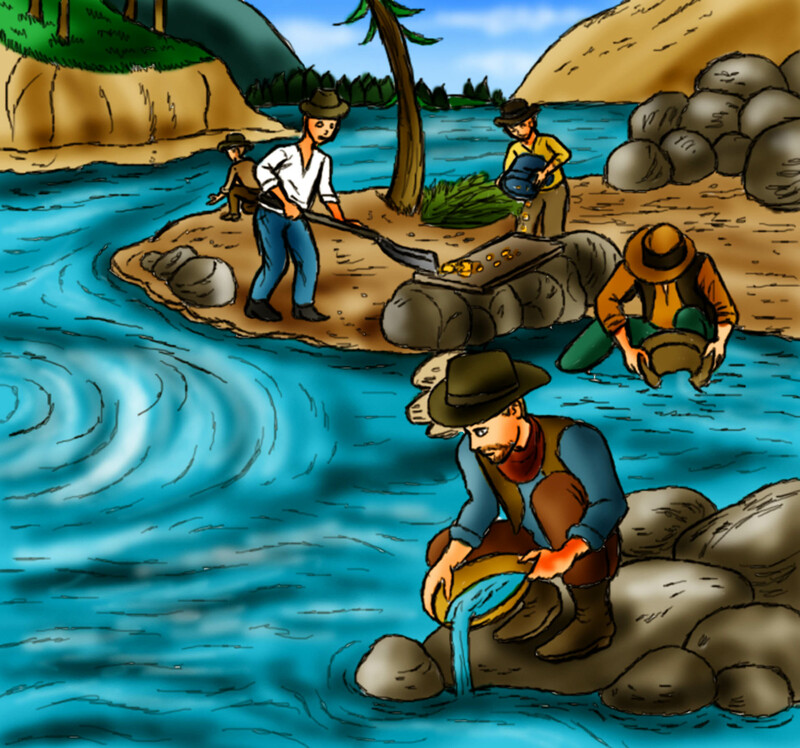 The California gold rush took place in the days of the wild west, when thousands of people flocked to the area convinced that they would find gold and make their fortunes. This poem was written in 2009 by Paul Perro. It tells the story of the gold rush in a fun and exciting way, from the perspectives of the two people at the beginning of the story, James Marshall and John Sutter. After you have finished enjoying the poem, please scroll down a little further to find out more facts about the gold rush. He dreamed of being rich. Just lying in a ditch. He showed it to farmer Sutter. He started to frown and mutter. “About what you have found. They’ll come from miles around. And trample on my farm. He would button his lip. He let the secret slip. And that friend told another. The hills were filled with gold. From the East wagons rolled. From France, and Britain too. But still got rich enough. Gold was harder to find. All the land had been mined. Looked out across his land. The gold rush begain in 1849. At that time, in California, gold belonged to whoever found it, and a successful miner could become very rich indeed. Thousands of people left or uprooted their families to try their luck. Some became rich, but many more did not. The unlucky ones included James Marshall, the farmworker who first discovered a tiny gold nugget smaller than a pea, at Sutter's saw mill. He died in poverty in 1885. John Sutter also suffered as a result of the California gold rush - his house and land were invaded by miners, and he left California in 1851, heavily in debt. Before the gold rush San Francisco had a population of 600, at the end it had 50,000.